An inspiring new book written by Debra Prinzing and gloriously photographed by David E. Perry has just crossed my desk. Well O.K., I asked for a free copy to review but the first statement sounds so much more professional. We learn how the flowers are grown and harvested, and can smell the aromas and see how the natural look of the flowers please the eye. It's an unusual bride who carries a mixed bouquet of local dahlias for her wedding bouquet, but Prinzing found one and Perry shoots her in her best running form. I wonder if she's wearing sneakers. ©David E. Perry, all rights reserved. The author makes a strong case for buying local; one reason, the flowers will last days longer. 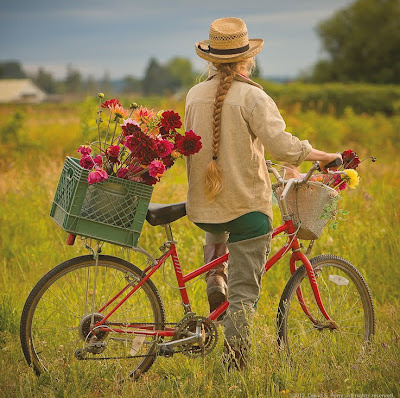 When I had my own flower and herb farm I was astonished to find that my cut tulips often lasted two weeks, whereas those I had always purchased from florists or the super market looked good for no more than five days. Venezuelan roses never smell or have the charm of these. 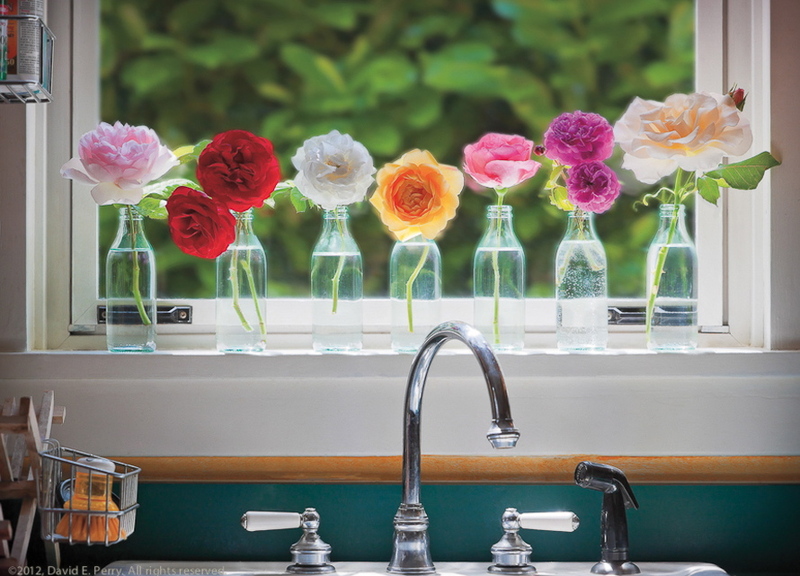 I love the tips Prinzing offers that home gardeners can use in their own arrangements. In fact I was so inspired that after finishing the book I ordered and planted 15 large dahlia tubers in my roof top containers, way too many for the space I had available. Prinzing and Perry are both to blame. When I was growing for local resale using organic and sustainable practices, despite my care an occasional bug would wander out of the flowers onto the table top. I still wonder how other people prevent that in field-grown flowers without spraying. A lady bug is cute, but no bride wants a Japanese beetle crawling down her arm. Debra, care to weigh in? For more on my own local and organic floral designs see post just below this one. I had no idea. I knew (I think from a book title of yours) that you grew lavender and gardened and lived in the country, but didn't know the extent of it. Flowerfarming too? How cool. I'm hoping to read the book soon. Been following their progress for a while. Hi Ellen, thank you for the wonderful story! And as for the issue of keeping their blooms bug-free, I've seen two practices at work on sustainable flower farms. First, while it is labor intensive, there's the manual removal method. Second, many growers use insecticidal soaps, which are earth-friendly. Oh, one other practice is to use IPM, applying beneficial insects to fight off bad bugs. 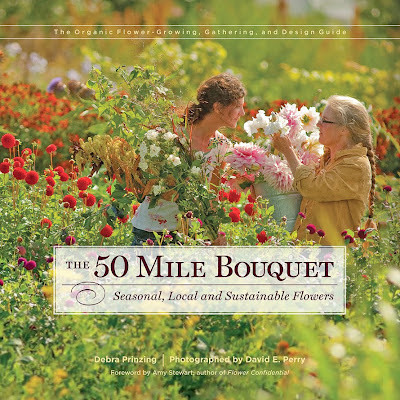 No guarantees that the stray bug won't crawl onto your dining table, but I haven't seen any in the course of working on The 50 Mile Bouquet. The only other reason I can think of for this is the practice of storing just-cut flowers in walk-in coolers . . . those chilling temperatures keep flowers in perfect condition before going to market and they might do the trick to chill bugs, too!